Besides the work on the Egyptian Museum Chariot Project, work continues to study the footwear in the collection as well. Due to the excellent collaboration with the responsible curator, Wafaa Habib, we managed to register a fair number of sandals, shoes and other footwear, including the leather mules from Deir el-Medinah, more examples of sewn-edge plaited sandals, a fibre open shoe as well as leather eared sandals. The large majority registered this year, however, are wooden tomb sandals. Moreover, this part of the collection is being refurbished and newly written labels will be included. We have good hope that we will be able to finish the re-organisation within two weeks from now. A new project was started several weeks ago, dealing with the leather finds from Fustat. The far majority of this corpus, however, consists of footwear (see http://www.leatherandshoes.nl/ancient-egyptian-leatherwork-project-aelp/). The material was excavated by the IFAO in several seasons work. 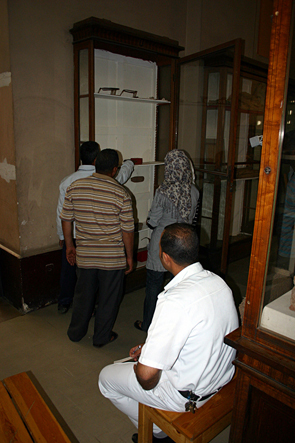 The Coptic Museum Project, studying the leather and basketry collection, is started in May as well (http://www.leatherandshoes.nl/coptic-museum/). More information about this project will follow in due course: on June 14th, it will be presented at the Netherlands-Flemish Institute in Cairo. During this event, the recently published book ‘Sandals, shoes and other leatherwork from the Coptic Monastery of Deir el-Bachit. Analysis and Catalogue. – Leiden, Sidestone Press’ will be presented. The book can be read in the e-library of the publisher (www.sidestone.com). For a list of recent publications on footwear and leatherwork see the pages dealing with the projects. Refurbishing the showcases. Photograph by A.J. Veldmeijer. Print article This entry was posted by andre on 1 June, 2012 at 3:19 pm, and is filed under Uncategorized. Follow any responses to this post through RSS 2.0. Responses are currently closed, but you can trackback from your own site.